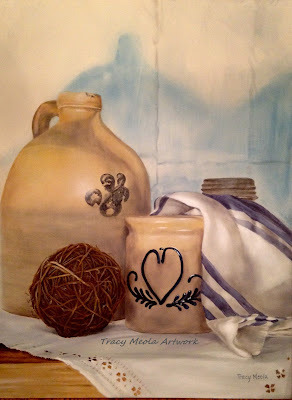 I started this still life painting a while ago and put it aside to work on other projects that came about. So I pulled it out of the unfinished pile and finally got it done this week! It feels good to have it out of the way. Although I don't feel that this is one of my most "realistic" paintings, I am pretty happy with the way that I was able to capture the sunlight that was streaming across the still life. When I look at the painting I can see the light the same way it was the day it was set up.